Since the inception of the revolutionary Compact Disc (CD), the life of the common folks has changed dramatically. No longer do we need to content with audio cassettes and video tapes that goes all moldy on us easily especially in humid countries nearer to the equator and the costs involved in replacing them. The CD has heralded a new era of audio quality and storage solution for the likes of you and I. More than a decade has passed since the humble CD planted its roots firmly in our lifestyle and the level of sophistication of the CD has evolved significantly, never more so than in the PC industry. With ultra portability and slim as the buzzword in the field, nearly every PC peripherals are shrinking, dimensionally speaking of course. An area revolving around slim dimensions and portability is the notebook sector. With manufacturers pumping out sub-2kg notebooks in bulk, some would start wondering how space hogging storage drives like the good old floppy drive, CD-ROM drive or even DVD-ROM drive fit into the high-end ultra compact form factor notebooks. Well, they dont. Even with current technology, squeezing all these devices into a notebook and making it affordable, petite and weigh under 2kg is an impossible task. Let's say if its somehow achieved, it's simply not economically feasible as the resulting price will be astronomical. Thus, these space hoggers are designed as external hook up components and as important as these devices are, they are actually not often used. 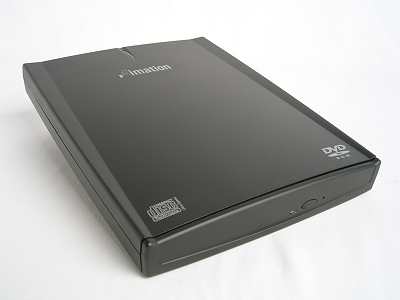 Imation, answering to the ultra lightweight and portable beckoning, introduced an all new slim and light form factor external combo drive in a sweet 24x24x24x (CD-RW/ROM) and 8x (DVD-ROM) speed terminology. Lost and confused? No idea what these numbers with the x means? Dont fret, well cover the numbers from left to right. Basically it means 24x CD-R write speed, 24x CD-RW rewrite speed, 24x CD-ROM read speed and lastly 8x DVD-ROM read speed. This is the translation method for all combo drives out there unless otherwise stated by the manufacturer.